defense cannons at a nearby plant, but they were left largely undamaged. Ottbergen would lose 79 more of its people before war's end. coinage privileges in 889 by King Arnulf of Carinthia, and first mentioned as a "city" in 1147.
fortification was built. Osnabrück became a member of the Hanseatic League in the 12th century. part of Prussia in 1866. Britain's King George1 was born here, as was Erich Remarque. leftover bombs on the city, not for any military significance, but merely for its use as their trash can. Osnabrückers during the course of the war (Germany did not attack Coventry until 1940). 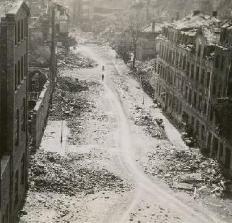 78 air raids later, and Osnabrück was no more. The last bombing took place on March 25, 1945.
bombing killed a couple thousand people, including 268 Allied prisoners of war, and injured 2000. 750 major and 3600 smaller fires incinerated the city. The old part of town was 85% destroyed. and a hospital went up in flames. 900,000 cubic meters of rubble was left. was chartered by Landgrave Ludwig IX. who built his residence and a military garrison there in 1763.
early and mid 19th century, the town experienced prosperity and built Europe's first shoe factories. that matter the young teen age dead German soldiers." series of buildings were erected by a member of the Saxon royal family. Paderborn was an important trading town and became a member of the Hanseatic League in 1295. British bombers accompanied by 115 American fighters set their sites on Paderborn. 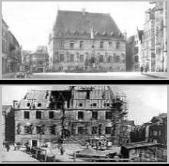 of one of Charlemagne's palaces was discovered beneath rubble! Triberg in the Schwarzwald. For over hundred years, clock making was a local tradition. and by 1808 there were already 688 clock makers and 582 clock peddlers in this neck of the forest. Clock peddlers would peddle the gaily painted and embellished clocks in summer. Forest" once held a Roman settlement. served as their residence until 1565.
and the "City of Gold" because of its jewelry and clockmaking. Church was dedicated in 1122 and the Rathaus built in 1508.
created around 1500 near Erfurt. ancient city entrances were later blown up by Soviets. typical very old timber framed German towns holding nothing of military importance. Attendorn, with hundreds more in severe disrepair. large part of the town hall blew up. The huge explosion claimed 35 more lives.